Ok, purchased the new Rand McNally tablet, and though I’d compare to this app on my spare iPad. While I was really hoping for something to be useful on my old iPad and save me $400, this app isn’t really close yet. Notes to developer: 1) change some of the settings from metric to standard, or give the option of choosing from one or the other. 2) Maybe it’s there, but I couldn’t find for the life of me. Ability to search for the standard US truck stops for fuel (Loves, T/A, Petro to name a few) along the selected route. If you do this, provide list in order of distance from current location and add exit numbers to each in the list, prior to selecting the preferred stop. 3) Scales. List Cat Scale locations along the route, and or in vicinity of location when searched. 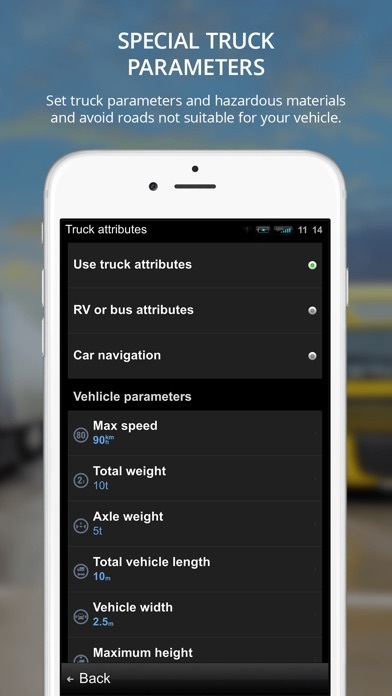 4) Enable filtering so auto only fuel stops don’t become mixed in with truck fuel stops. Can’t use fuel stop search, knowing it’s showing so many auto only fuel stops. Like I said, it’s close, but not useable for anyone in a truck who needs some of this vital mile by mile info while on the road and trip planning. Don’t wast your time this app is trash!! Going through CT towards NYC, this app tried to route me down the Wilber Cross Parkway, which is clearly marked “No Commercial Vehicles”. As are all Parkways in CT.
Until I bought a commercial gps (because I didn’t want to keep paying subscription) I used this app all the time. Sure it has a few faults but they all do. Most of the time they get ironed out in updates. Remember, gps is a tool not a rule. Once you get the hang of its functionality, it’s quite easy to use. Would like to see voice commands though. Especially loved to 3D effects in the map. Even the buildings can be 3D. If you don’t like this app, don’t use it, but don’t trash talk it. Maybe you just have a certain mindset in what you want, and this isn’t it. Great work developers. Maybe someday I will return to it, maybe sooner if this current one gets its head out of its $!?&. Update gave it a lobotomy lol. I downloaded the app and I can say with certainty that I do not recommend this app to rookie drivers in the United States. I have been driving the truck now for 30 years and have use other GPS and this program constantly wanted to route me on two lane Rd.. most were truck shouldn’t even be instead of rounding via interstate. It is my opinion as a professional driver that this app needs to be polled and have some serious work done to it with all the deficiencies fixed before they let anyone downloaded and charge money for it. It’s not worth the money not in the current state Ann I am highly disappointed at that time that the program or took to right this program and not do it correctly. Needless to say I will be deleting this program off my Apple iPad and I will be sending them an email not to charge my account for premium features as I will not be using it. More accurate speed limit information (I’ve used the feature for reporting wrong speed info, but it doesn’t allow for the stating of the current speed limit). 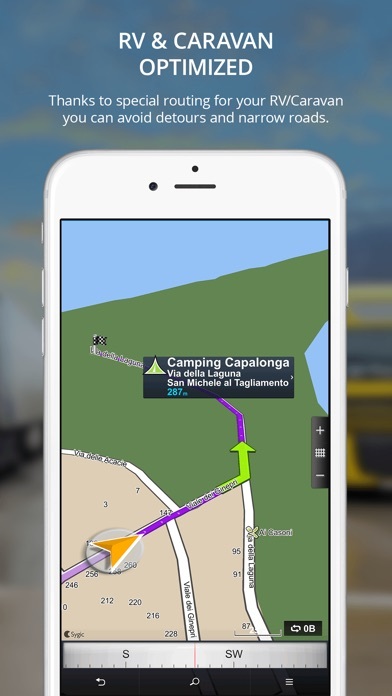 Add truck stops, truck rest areas, truck refueling locations, truck parking areas (I’ve tried using the app to search for these locations and was not successful. I’ve had to use other apps or the internet to complete these searches then try to plug the information into this app). The last issue brings on the next issue, the maps do not except all addresses. 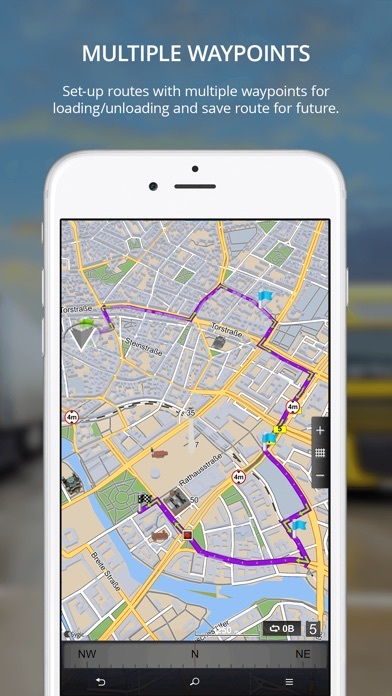 GPS is severely lacking if you can’t input your destination because the maps are missing key location information vital to truck drivers. It’s obvious that they took the car gps and added low bridges and weight restrictions and that’s it. It try’s to guide you down small streets and neighbor hoods. Too many turns for a truck to take you the shortest way. No options for prefer freeway. I paid for traffic and speed cameras but it seems there is never any traffic even when I’m sitting in it and speed cameras must be invisible. 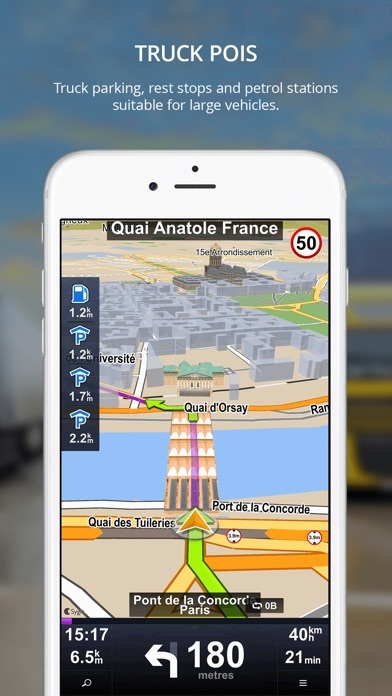 There are only a few Trucking navigation apps out there period and I don’t know why they charge so much when the app is worse than the lesser priced car gps. Wish I could get my money back. 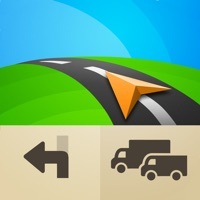 I ran this app next to a Rand McNally for a few weeks before relying on it. It was a little confusing learning to set-up routes, but I've got the hang of it. I've run Michigan's UP and LP, Wisconsin, Iowa, Illinois, Minnesota, Indiana and South Dakota with it and haven't had any major problems. I would like to see earlier notifications (550 yards doesn't leave time to take exits when the POI is 300 yards off the freeway) of POIs (especially weigh stations) and an improvement to the option of dragging the route to change it. 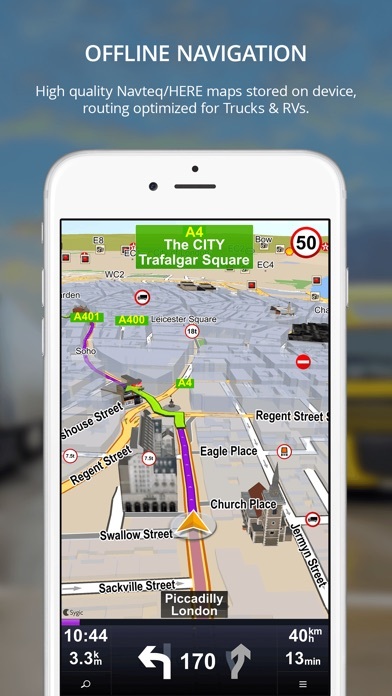 Also, most of the time, the speed limits posted by the app are lower than posted on the road. I didn't want to spend the money on a dedicated device because I already have two Apple devices. So far it has not taken me down any truck restricted roads or toward any low bridges. With a few more tweaks, I might give it five stars. More by Sygic a. s.